Matthew Dickman: Brilliant? Sensationalist? Or Both? Matthew Dickman probably wouldn’t be the poet that he is today had he taken the MFA route for poetry writing. In fact, Matthew Dickman makes a sure fire case for proving the old cliché that poets are born not made. No one could have taught Matthew Dickman how to write poetry. It came from some sort of intuitive voice the way a prodigy can suddenly compose exceptionally talented work independently from schooling. The only thing Dickman needed to set that spring of talent off was an introduction to good contemporary poetry, and once that happened for him, sparks exploded across the page. That's what I believed after reading Dickman's brilliant debut book, All-American Poem. The work felt alive, spontaneous, the music, distinctly his own signature. No one trained him, no one disciplined him, no one turned his wild poems into a groomed poodle. I feel for Dickman because he had a hard act to follow after his first book. It so happens that for many writers the first book is the best book and then it's a matter of trying to keep that high going. Not easy. It’s strange because I read somewhere, an interview perhaps, that both Matthew and his twin brother, Michael Dickman, who is also a gifted poet, read very few books in high school. It’s disconcerting but understandable: the most memorable books I read in high school were not assigned. Public high school texts are usually boring secondary sources. You learn to write by reading the classics, by finding exceptional authors that speak to you in a way that changes your reality. In any event, Dickman no doubt made up for lost time because no one can write from a vacuum. Had Dickman entered one of the MFA programs from the get-go when he began trying poetry out for the first time, the critical process would have knocked the passion right out of his soul. Granted, there is a long list of extraordinary poets that have benefited from MFA writing programs. But I can’t help guessing how many young Matthew Dickmans were destroyed from the process, how many had the potential but that tiny seed was ripped up from the soil too soon convinced by the so-called professionals that he or she didn't have what it takes to be a writer? No one can make that determination or judgment call for a young writer. Time is the best teacher with practice and effort and development. I should say that Dickman is the recipient of a number of prestigious fellowships for writing programs, but that's a different kind of setting for writers in that they are provided financial support, and a social artistic sanctuary where they can write and read. That's quite different from a grading-evaluation-critical college degree program. My friend, a professor and author of two poetry books, who earned his MFA in creative writing, told me a few shocking stories about professional writers who deliberately humiliated their students in class. But even if they don’t go so far as to embarrass their students, the approach is often more negative than positive, such as asking the class to comment on student Y’s poem: “Okay, tell me what’s wrong with this poem.” And that’s only the beginning; then there’s the shredding, and the subjective rules: too many adjectives! Too many verbs! By the time they’re finished slashing and whipping the poem into shape, there’s nothing left but an empty shell, a perfectly manufactured poem or a duplicate copy of somebody else’s poem. 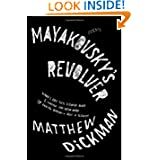 The centerpiece of Dickman’s new book, Mayakovsky’s Revolver, is about the death-suicide of his older brother. My own brother died when he turned thirty-three from an overdose of prescribed pain pills, but unlike Dickman, I can’t write about it. I won’t even go near it, or attempt to write about him, as though there were a huge Do Not Enter sign that turns me away whenever I come close. out into the air again, and down the street, and whistle maybe, and go home. These poems kept me up at night. Kafka said that if your writing isn’t an axe for the frozen sea inside us then it’s probably not worth much. Certainly Dickman’s work is a disturbing blow to the head and heart. I read these poems and think about my brother who won all sorts of prizes and trophies from speech awards to college tennis scholarships, but no one saw the suffering or the depression buried beneath the ribbons and honors. Or if we did, we avoided it. How do you cope with that sense of shame or guilt that you couldn’t prevent it or see it coming? In front of the mirror, pulling the paper trigger until it tore away. Admittedly, Dickman’s poems are anything but boring. You hang on to every word the way you’d hang on to a wild roller coaster ride. It’s what some people would call a “thriller”. But here I have to stop and ask, is that why these poems are so captivating? Do they mirror our addiction to entertainment, the Age of Sensationalism? True—reading Matthew Dickman’s poetry is a little like reading a mystery murder thriller, a page turner, as we like to say, but there’s something else about his poems, acknowledged by the Academy of Poets, that distinguishes Dickman’s writing from sheer sensational thrills: it’s called natural talent. You can’t fake what Dickman has accomplished with a bag of tricks to keep the audience amused or entertained. Dickman’s poems are marked by a visionary power of language. Above all else, he has the “ear” for it, the boy can sing. And as Charles Wright once said, if you can’t sing, get out of the choir. However, I think Dickman has to be careful about going for the "hook" as the final goal. With his talent, he doesn't have to settle for less. Interesting that Dickman chose Vladimir Mayakovsky for the title. The two poets have a few things in common: Mayakovsky was a flamboyant figure; his poems, avant-garde revolutionary Russia, electrified the coffeehouses and theaters. Passionate and brilliant, Mayakovsky had difficulty conforming to the standards of his time. He did nothing in moderation. In spite of all this—or because of it—his poetry bristled with a feverish energy of originality. Mayakovsky took his life as passionately as he lived it; when he believed that his long love affair with Lili Brik was over, he put a gun to his head. Well I can’t say if Matthew Dickman is as wild and crazy as Mayakovsky, but there is a driving force, a passion that runs through both poets’ works. 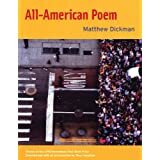 All-American Poem, Dickman’s successful debut book that earned him a sort of rock star status in the poetry biz, and his second book are autobiographical, a coming of age narrative in a rough and tumble Portland, Oregon neighborhood. Drugs, bully-behavior, knives, guns, alcohol are warning signals that appear along the smoke-filled cafés, alleys and streets of Dickman’s poems; he takes you on a dizzying tour to his neck of the woods, the other side of America, a declining middle-class America that is unfortunately becoming the all too common condition of our eroding cities more than the exception. There is a direct connection between high unemployment, poverty and the escalation of crime. Teenagers are pretty much on their own without parental guidance. 1 in 4 students fails to get a high school diploma. I don’t get the sense that Dickman sees himself as a victim of his environment. He’s simply telling his stories the way a reporter describes a scene and snaps a picture, but the facts of the story are translated through Dickman’s vivid imagination and power of language. Those of us who’ve lost a loved one understand only too well what this sudden disappearance act is all about, this awful silence, this “no more thing / of him”. After her husband-author, John Gregory Dunne, died from a heart attack, Joan Didion wrote in her beautiful memoir, The Year of Magical Thinking, that she could not accept that he was not returning—that he would come back, and it was then that she spoke about the significance of the title, “magical thinking”. We want to be able to pick up the phone and call if only to hear his voice or ask about this or that, it’s the small talk and little pleasures we miss most, coffee, sharing a news clip, places and locations that have meaning only because you shared that beach, that café, that theatre together, but the line has been permanently disconnected. There are a few poems in this collection that – well – let’s just say if they were submitted for publication under my name, they’d probably be returned. Dickman doesn’t have to worry about that now that he’s a big hit, well deserved and earned, I would only add that this is not a race, he can take his time, and he ought not to worry about the critics or be pressured. All in all, the music of these poems “play” brilliantly well. Matthew Dickman is the author of All-American Poem, winner of the APR Honickman 1st Book Award, the Kate Tufts Discovery Award, the May Sarton Award from the American Academy of Arts and Sciences, and the coauthor with Michael Dickman of 50 American Plays. He lives in Portland, Oregon.